In the last week, my house has felt a little bit like Noah’s Ark, just before the flood waters actually lift it and carry it off! It’s been very wet and cold across much of the UK, but as it’s officially still summer (it’s August after all) I refuse to put the heating on. I love autumn, don’t get me wrong, but it has its place, and that starts next week. However, I’m about to put off the arrival of autumn for a little while longer by going on holiday, so I’ve been planning my holiday knitting. Sadly, my airline won’t allow knitting needles on the flight, but I’m taking plenty of projects for when I get there. I had contemplated taking one big, selfish project (a cardigan or perhaps the knitted blanket for grown-ups that I have in my mind’s eye), but as I have four good friends who are expecting babies in the next few weeks, I decided to use the time to knit baby gifts. Here’s my yarn, ready to go: a half-finished Eole baby cardigan by Nadia Cretin-Lechenne in a lovely greeny/silvery skein of Fyberspates Scrumptious sock, along with some cream and navy Debbie Bliss Baby Cashmerino for two more cardigans (possibly Meredith by Ruth Maddock) and some incredibly pretty pink speckled Koigu KPPPM to make Linnie by Justyna Lorkowska. If I finish the baby knits, I’ve got some green and yellow Koigu KPPPM to start some Christmas present socks. So not quite the selfish holiday knitting I originally thought I would do, but I’m looking forward to some self-indulgent quality knitting time in the sunshine! I’m not the fastest knitter, so it may be a bit optimistic to think that I can get through 3.5 baby cardigans and a pair of socks before I get back. Still, the worst thing would be to run out of knitting, right? 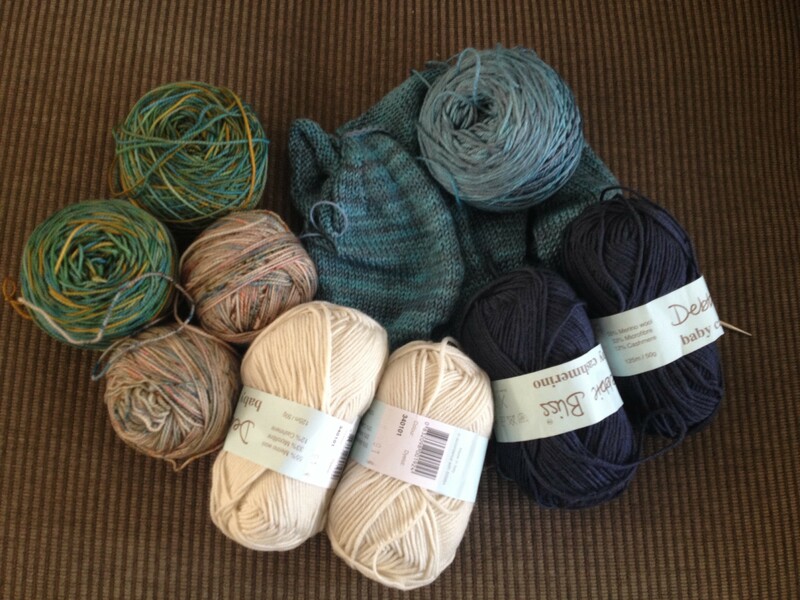 This entry was posted in Uncategorized and tagged autumn, baby knitting, holiday knitting. Bookmark the permalink.